I have been in the Aquarium, pond, and general pet supply business, along with a stint in the candy business now for over 34 years. I have run a brick & mortar business most of these years, as well as an internet business. In this time I have seen many anti-small business proposals come and go, however this Internet Sales Tax proposal is easily the most heinous and dishonest in the way it is being presented. Let me set the record straight and present some facts. First this is being called the "The Marketplace Fairness Act" by known dishonest politicians such as Harry Reid. This bill is anything but fair. As a brick and mortar store owner in LA County California, I had to only collect and report sales tax to one authority; the California State Board of Equalization based on LA County and California Sales Tax. However as an Internet based business, I and others would have to report to potentially over 9000 separate entities (state & local), with the impossible amount of paper work and likely audits that would require more staff or paid outside help I cannot afford. IT IS NOT, as the difference in paper work proves this alone as the scam this bill is. As well, an Internet business has shipping fees, whether paid by the business or the consumer directly, these fees in the end are passed on. This is something a customer of a brick & mortar business does not have to pay. As well, a brick & mortar business has the advantage of immediate product availability. I know for me as a consumer, I like to see and view, and then take home a product asap. I also know from a retailers point of view in the aquarium/pond business, most persons inquiring as to fish medications or similar must have these immediately and are more than happy to pay a higher price at a brick & mortar business so as to have this product immediately. Another lie tossed about is that many will claim that Internet Business "steal" customers after visiting a local brick & mortar business. While this might be true to some extent in some business (if you are to believe Best Buy or Walmart), this is further from the truth than the east is from the west in my field of endeavor. As Senator Roy Blunt of Missouri stated: "it is a bridal shop in St. Louis where customers try on dresses, check the labels for the product code, and then order the same product online, free of sales tax". Sorry Senator, I too can report similar cases from my Brick and Mortar business; HOWEVER for every one of these cases I can cite 50 of just the opposite. The FACTS ARE, I receive over 6000 hits per day to my many information pages that provide correct, researched information that is not found at many PetCos, PetMarts, and local Aquarium/Pet Stores. These persons in turn often email and take up very limited staff time to often answer further questions (that are often already in these articles), only to then purchase at their local store. I know this for a fact based on our stats, and in many ways I certainly understand this too when it comes to their sick pets/fish. When I compare this to my brick & mortar business, the VAST MAJORITY of customer questions were from CUSTOMERS who primarily patronized our business. In fact it is about 50 to 1 the number of inquiries of of non customers when compared to my brick & mortar business. Add to this that I generally sold products at a vastly higher mark up, it was much easier to "shoot the breeze" with even non customers and still make a profit, unlike our Internet business where often we have to cut off "lazy" email discussions and ask these persons to read the information we have provided, only to get back very hateful emails from these non-customers or at the very least persons who will purchase one item every two years and then send over 200 email questions in between these infrequent sales. The FACTS are we NEVER had to deal with this in our brick and mortar business!! Another comment I have read by many persons either ignorant or hateful of small Internet business is that Amazon supports this bill. Amazon knows full well that this will considerably lower competition to them, and at the very least force many small websites to join their family of companies and pay their high fees and follow their VERY controlling policies. HOW DO I KNOW? Amazon has attempted many times to get us into their "fold". As well, Amazon is the same "Big Brother" company that has been known to go into a Kindle and remove a book from a customer, so why not support a "big Brother " tax? From my field of endeavor, I also know that Amazon is the same company that sells many junk aquarium products (that any knowledgeable business would never sell), in particular UV Sterilizers that are at best clarifiers than can NEVER perform true level 1 or higher UV Sterilization. Also many reviews on Amazon are not based on facts or correct use, in part because Amazon provides NO good information (based on their selling platform) as to proper/correct usage of the product. A good example here is the Rena Smart filter which is a top notch product when used properly, but based on erroneous Amazon reviews you would never know this. 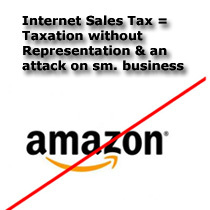 The bottom line, is Amazon is not a company to listen to when comes to the Internet Sales Tax Issue. Another lie is this: "the Internet Sales Tax Bill is not a tax increase at all. It only ensures that taxes already owed are actually paid." Sadly Republicans such as Senator Roy Blunt of MO or Senator John Thune of South Dakota have bought into this absurd lie. How is this not a tax increase? I already pay higher than many areas in property taxes to support my local police. I should point out that I use far less civic services than my brick & mortar business ever used, especially when the volume of business is considered! Sorry Senator Blunt, I have owned a Brick & mortar business for many more years than an internet business and the FACTS ARE I get VASTLY more time consuming enquiries online or in forums about fish, aquarium, pond, diseases, etc. where by the customer goes to their local merchant after I provide free advice. As I pointed out earlier, the difference is not even close. This is a sad rumor that even many misinformed Republicans such as the before mentioned senators have believed. The facts can be painful, but these Republicans are clearly in the back pockets of Big Business if they actually are going to repeat this lie. This tax is nothing more than another dishonest anti-small business power grab by many in Congress such as Harry Reid and President Obama, and when you look at their track record of dishonesty, why should they be believed? Worse there is a rumor, if need be, so as to get this bill through the House of Representatives, it might be attached to a bill to aid the FAA with funding lost in the sequester cuts. Obama has already lied here and attempted (successfully too) to push the blame onto Congress and this tying of the two bills together would again make the House of Representatives look bad if it were to vote down.